These are so much fun to make and very addicting, these are Button Fairies that I am making for an upcoming swap for Christmas ornaments over at ATC for Beginners Yahoo Group. I have always wanted to try to make them but always something else to do or get a swap done or just forgot about doing. I seem to have a never ending want-to-do list. There are many resources out there to make these, they are relatively easy and a great way to use up buttons, and scraps, beads and a bit of bling. I appologize for the poor pics, I scanned today instead of using the camera which does not do these any justice whatsoever. I like to curl the tails on my fairies, they take on a whole new look. Tomorrow I will complete some new fairies with a slightly different take on them. And here are some painted and stamped snowmen inchies for the Inchies onexone Yahoo Group. These are for the month of November lottery. We have contributors to the lottery then those name are put into Random.Org and a winner is picked and they receive all the inchies. I only had to make 3 but when it comes to snowmen I can't stop. 3 are handpainted freehand by me and 2 are stamped. I wonder who will be the lucky winner. We have to wait to the end of the month to find out. Your button fairies are beautiful Les, lovely assortment of beads and buttons. 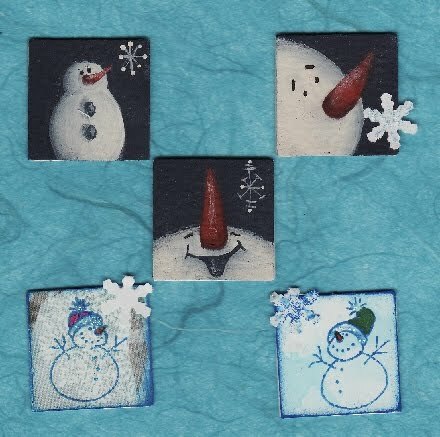 ...oh, and your snowman inchies are just adorable!! Oh, these are sooo cute. I love them. Last week went by in a blur so I didn't even look at the inchies. Glad I did now.